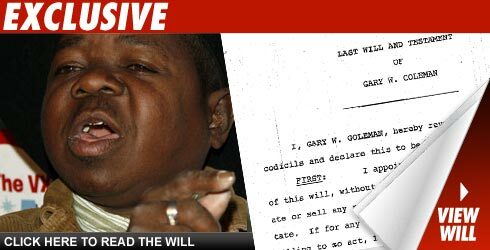 TMZ has obtained a copy of Gary Coleman's 1999 will, and it has an ominous directive in terms of disposing of Gary's body. According to the will, Gary wants his body cremated and wants his personal representative to "plan a wake for me conducted by those who have had no financial ties to me and can look each other in the eyes and say they really cared personally for Gary Coleman. Gary bequeaths "my entire estate to the Trustee of the Millennium Edge Trust." He is not more specific. Gary's former manager, Dion Mial (who filed the papers) claims Shannon Price, Gary's ex-wife, "has been removing personal property from [Gary's] home which has not been inventoried or accounted for." Mial is asking the judge to immediately appoint him special administrator of Gary's estate so he can give the mortuary a directive to cremate the body.